Rambo's Rampages...: Grease is the word, is the word that you heard. Grease is the word, is the word that you heard. Actually, 'busy' has been the word. Anyway, this is called "Rambo's Rampages" for a reason. I'll get back to the star of the show: Weight has been the issue. Thankfully he seems to be back on the right track, but after a stomach bug Rambo lost several ounces. He then proceeded to either continue losing weight or not gain any back. So after adjusting his food and calories a few times we seem to have hit the nail on the head. And at last weeks appointment he had gained 7 ounces. One ounce away from 11 pounds. Yay! Then there was the time my dad almost killed me with a rolling stool. We also had our first experience where his G-tube jumped ship. Yeah, you can probably imagine my surprise when I saw it laying on the bed next to him as opposed to sticking out of his belly. Of course Ben wasn't home. Of course we were told just about nothing in reference to his g-tube. Of course my other son wants to stand right in front of my face and ask me repeatedly if he can eat the candy in his hand while I'm in the midst of trying to reinsert it back into Rambo's body. Thankfully, with the help of my good ol' neighbor we got it on the second try. And the story should end there, but let's be honest, this is Rambo and nothing is that easy. It's ALWAYS something. We started noticing dark brown coming back up into his tube. We weren't too concerned at first but thought we would keep a close eye on it. Then when we went to flush his tube it leaked all over his belly. Now, this couldn't have happened during doctors office open hours. No. Of course not. So we had to take him to an emergency center. It was decided to flush the tube and then pull back to see what we get out from his belly. It appeared to be just some dried blood and small clots which is not abnormal with the reinsertion of the G-tube. However, reference the first line of this paragraph again and you'll see that it couldn't have stopped there either. The nurse was happily removing the blood clots so they wouldn't clog the tube and suddenly the entire length of the tube is filled with fresh red blood. So now everyone is slightly more concerned wondering where the active bleed is coming from. Then the tube starts to leak around the stoma (site where it enters the body) and now his belly is all bloody. We do a dye test to make sure the tube is in the right place. It is. (It's a good thing, Rob!! :) ) JHH tells us to watch the bleeding for a day or so and make sure it doesn't get worse. The conclusion was that the trauma of reinserting the tube twice and stretching the stoma some caused the bleeding. Well, today is one week and a day and the bleeding has stopped as has the leakage around the stoma. Yay! Of course, just as we're getting back on track from that, the seal inside his G-tube broke and everything leaks back out of it. 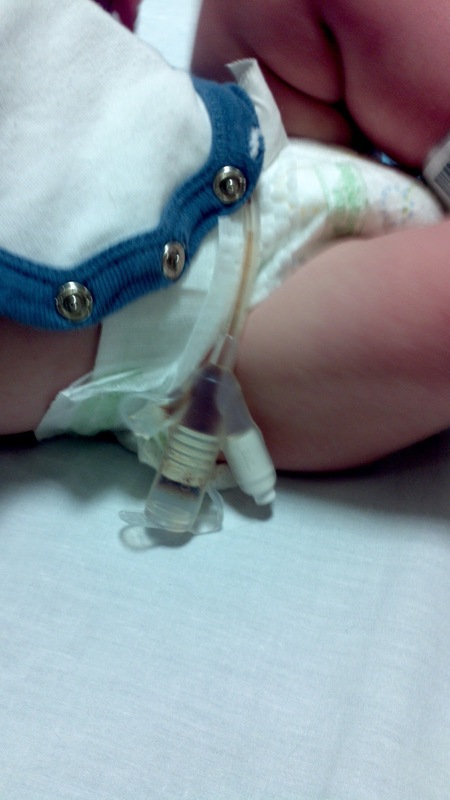 So we had to ghetto up a solution using an old feeding tube, hair bands and a q-tip. It's a good thing we're resourceful. So that's where we are. 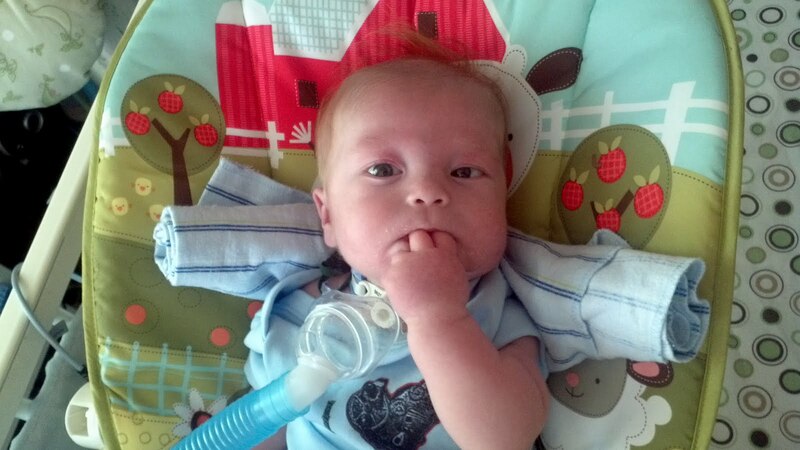 Little man keeps us on our toes but at the moment (yes, I just checked on him) he is doing well. Not sure what's gonna happen later today or tomorrow but right this second he's good so I'm good. And congratulations to Ben for managing to keep you around for 8 years ;) Love you guys so much!